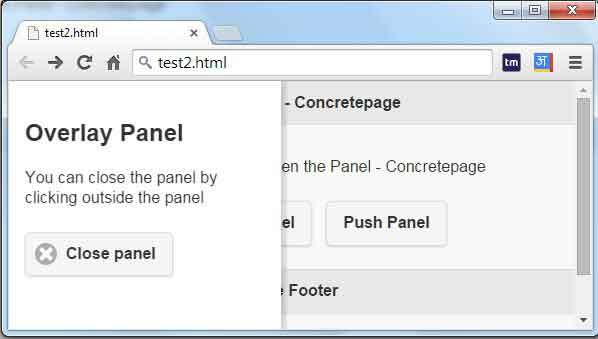 This page will provide the description for jQuery Mobile Panel and Collapsible and their examples. Panel can slide right or left in mobile screen and Collapsible helps to hide and show content. We will go one by one in their details. Panel is slider in mobile application. It opens in right side or left side of the screen in mobile. Panels are flexible and make it easy to create menus, collapsible columns, drawers, inspectors panes and more. To create panel in jQuery mobile, add data-role="panel" attribute to a <div> element and specify an id. A panel must correlate to the header, content and footer elements inside a jQuery Mobile page. We can add the panel markup either before or after these elements, but not in between. A panel cannot be placed outside a page. A panel's visibility is toggled by a link somewhere on the page. #mypanel is content area ID and will be hidden first time page load. And when we click on "open panel slide menu", #mypanel will be shown and if clicked again, #mypanel content area will be closed. In jQuery mobile panel, we can control all display mode of panel with data-display attribute. <div data-role="panel" id="pushPanel" data-display="push">: The panel will sit under the page and reveal as the page slides away. In jQuery mobile, by default panel will appear left side of the screen but jQuery mobile framework provide data-position="" attribute to set panel left or right of the screen. jQuery mobile collapsible provide hide and show content in mobile screen. It is a type of toggle menu which will open and close very smoothly. To allow data-role="collapsible" attribute to a container. By default, the content is closed. To expand the content when the page loads, use data-collapsed="false".